When you think UPVC, you think white. It’s traditionally the colour of the door you choose for its secure and energy-saving qualities. But these days, you’re by no means restricted to white alone. Over the past year we’ve seen most interest in black, grey and Chartwell green doors – but a new UPVC door can come in one of an extensive range of colours and with door furniture available in white, gold, silver, black, brushed chrome and polished chrome. There’s no excuse for not getting the ideal combination for your home. UPVC doors start at £800 for a coloured door with side panels at an extra cost if you require them. We manufacture locally in West Hallam using Liniar profile & Hoppe door furniture and manufacture the glass to your specification. 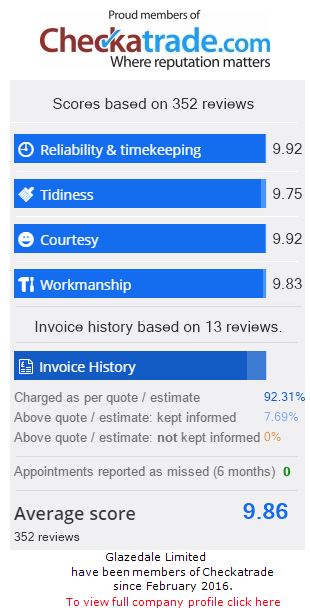 Composite doors range in price from £1,000 to £1,500 – talk to us about what you need from a door and we can advise on the best value. With styles from traditional to contemporary there will be one that suits your property perfectly. Composite doors come from the leading composite door manufacturer and are finished off in our factory with high quality door furniture. We also know our customers value security so we use only top of the range 5 point locking systems on all our doors. 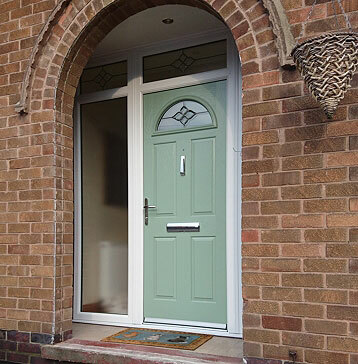 Take a look at some recent door installations to see the kind of colours and style choices available.